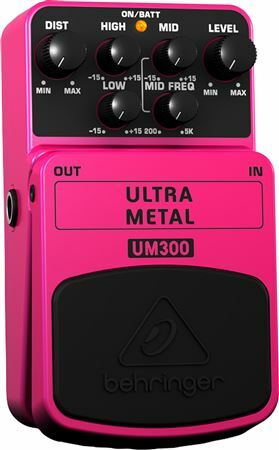 Get the most extreme and sought-after hard rock or heavy metal sounds with super-thick, tube-like distortion plus endless sustain with the Behringer UM30. 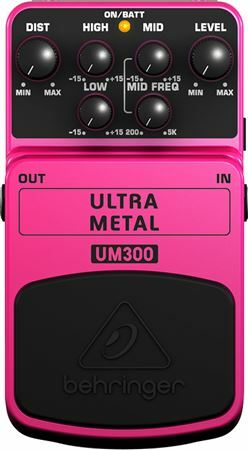 The Behringer UM300 effects pedal gives you the most extreme and sought-after hard rock or heavy metal sounds with super-thick, tube-like distortion plus endless sustain. Bought as a gift for my husband, and he loves it. This thing rocks for the price at higher volumes. At higher volumes the hum and unwanted noise aren't noticeable. At lower volumes even being pushed thru a noise gate and without having to adjust the noise gate so far down that you can barely hear the volume, the hum and unwanted noise is very prevalent. I'm not really crazy about the plastic body but for the price I'm not complaining. It's cool playing around with it. It's not the quality of the higher end pedals but it has its own character. Not sure if its road worthy but I like it for the price. For 25 bucks I'm not expecting anything amazing, but the plastic housing does feel a little cheap. So far so good. I wanted something I could keep at work, so inexpensive-ness was a factor. Not bad. Pretty good value for the money, but if you can afford something better, I'd go for it. When holding it, it does feel a little light and flimsy, but it seems to hold up well enough. Personally I don't like the way the distortion sounds. It sounds a little too electric and nasally. However of course I realize that the actual sound of the distortion is subjective; it might be the perfect sound for you, just not for me. But it is pretty impressive that it has a sweepable mid. Not crazy about the hot pink, but it makes it easy to find in the dark. I find the knobs to be a little stiff, but once I get them where I want them it plays fine. It's a Distortion pedal... Action?!?!?! ?